I am excited to announce the release of a fillable pdf format for the VIPAR, a new tool for your child life/hospital play toolkit. 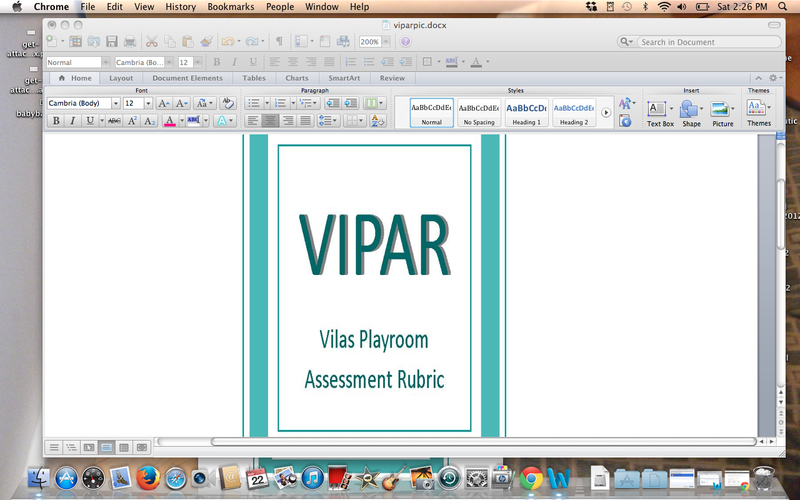 You can now fill out the VILAS Playroom Assessment Rubric (VIPAR) on your computer and print it out. The VIPAR is an assessment form to help you make your playroom the best it can be. There is a dream playroom in all of our imaginations. Time, space, budget constraints and infection control guidelines aside, we all know what we would provide children and families if we were able to do so. The VIPAR (Vilas Playroom Assessment Rubric) (click on bold green type to access) is intended to present the best possible scenario, and to measure how your playroom is meeting the needs of all pediatric patients and families at your hospital. Child life specialists, hospital play specialists, and administrators can use this rubric as a quality checklist to assess playroom design and operation. This rubric is several years in the making and has been test driven by many Bank Street College alumni. They kindly tried it out in their playrooms and provided me with feedback to improve the document, making it as accessible and flexible as possible. I owe them and others many thanks for their input. But the VIPAR is and should be a work in progress. So please give me feedback if you use it at debvilasconsult@gmail.com. The form will soon be available on the Child Life Council’s website at the Play Center located in the Resource Library. Deb, this is so wonderful—it will surely help a whole lot of hospitals and, ultimately, kids.